Editor’s note: This article contains graphic images. 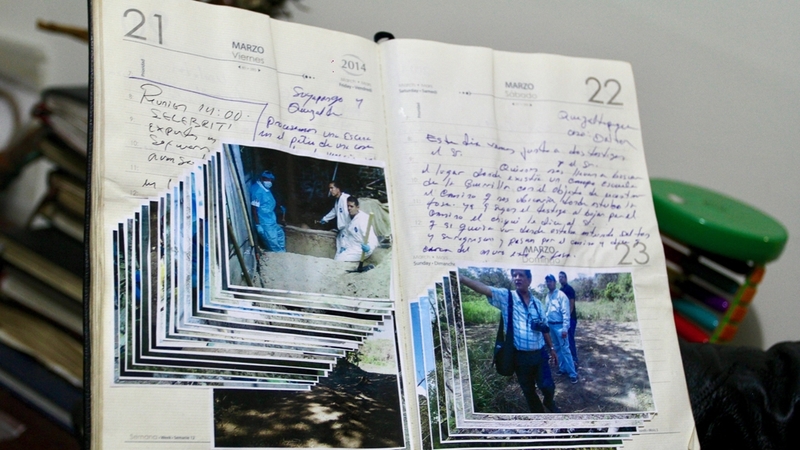 San Salvador, Salvador – When Israel Ticas isn’t in the field, he is doing most of his work in a cold, dimly-lit office with images of often disfigured homicide victims plastered on the wall. In one image, the skeleton of a woman’s body that has been unearthed lies on her grave. Another shows the body of a man who had his mouth sewed shut before being suffocated. “I might not have a certification or a degree, specialising in criminology, but I have 20 years of experience,” Ticas says. “The other experts, just dedicate their time to find the bodies, and when they find the corpse, they grab it, and pull it out so that Forensic Medicine can identify it,” he explains. “If you open one of those books you will find the photograph of corpses, describing the methods I used,” he says, pointing to a table of stacked books, all of them tell the stories of hundreds of victims. “When I started working on this, I observed how the cases were processed. They stepped on the corpses, and there wasn’t scientific proof of anything,” Ticas says. “So, I started to develop an alternative. I have fused criminology, archaeology and anthropology,” he adds. 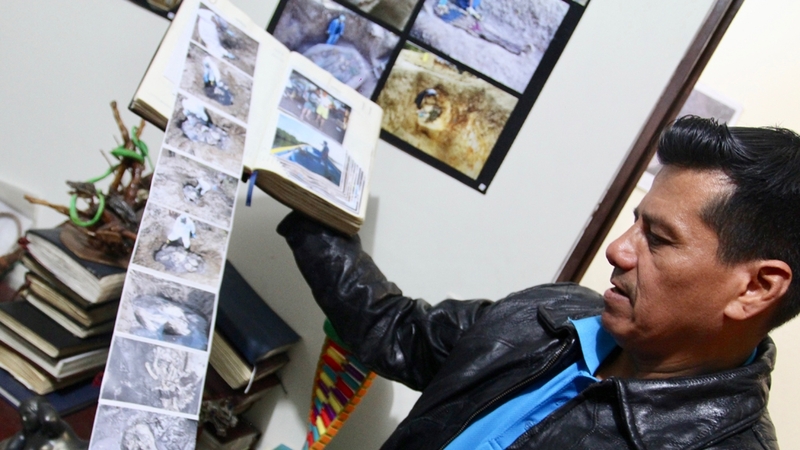 Some experts in the forensic anthropology field in El Salvador say that Ticas damages the crime scenes because he carries out “aggressive” excavations in which he prioritises the way things look in the tombs and not the conservation of the remains. 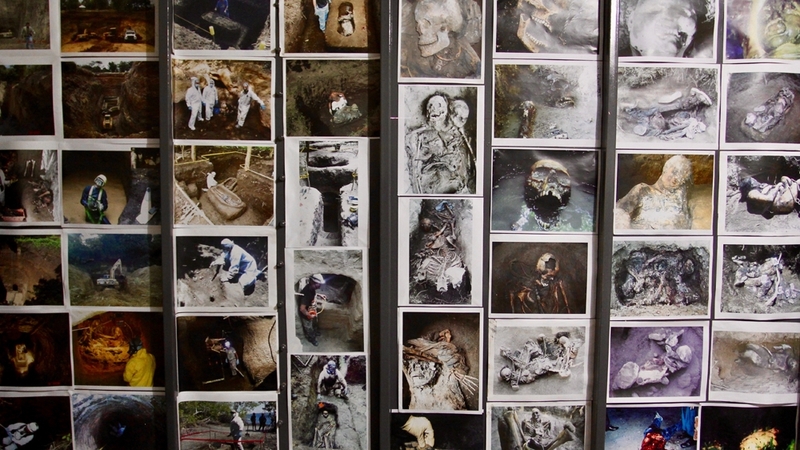 But in 2017, Jose Luis Perez Castro, the director of the Latin American Forensic Research Institute, praised Ticas and his work calling him “the maximum exponent in El Salvador and in Latin America when it comes to corpse exhumation”. The Institute of Legal Medicine in El Salvador did not respond to Al Jazeera’s request for comment. “For many, I am a farce. I am a madman, a person who alters and ruins everything. But, in other countries, I am Professor Ticas, the scientist, the engineer who has managed to merge techniques,” Ticas says. He says in 2006 bodies weren’t mutilated and dismembered as they are now. “One of the new methods is removing the skin from the victim. I think that comes from the movie Hannibal. It’s the way the gangs try to show their power by cutting all the pieces and the parts of the bodies,” he says. “I do not get into feelings, this is science, this is matter, and this is the shield I use not to break down emotionally,” he says. “I see a body of a child, and while cleaning it, start thinking about how much he probably suffered, my heart begins to feel, and my human side comes in. That’s why I’m forced to use my shield,” he explains. But when he does find a body that he wasn’t necessarily looking for, he publishes his findings, including a description of the person and a photo, on his three Facebook pages, hoping that a relative will see it. “This is my human side, my other self, the person looking for missing people,” he says.